Cannabis stock is flying high as a kite, and the the con artists behind the Cannabis Millionaire SCAM software and CFD trading app have latched on to this profitable new niche. Cannabis Millionaire is not just a term, it is a marketing gimmick which was developed by a clever group of affiliate marketers who understand exactly how to follow trends, manipulate facts, and turn them into lies and deception which suit their needs. Why is this happening now? Simple, the so called “cannabis hype” is at its peak RIGHT NOW and online marketers are riding this cannabis wave of success and peddling their filth. How does this effect you? Well, get ready for fake Cannabis Millionaire reviews, fake news advertisements, scammers with fake profiles on Facebook and Telegram trying to push this garbage, and every HYIP monitor, cryptocurrency, binary options, and Forex/CFD website will try to sell you this crap and tell you there is a “pot” of gold at the end of the rainbow. We also know that behind the scenes there are some unlicensed Forex and CFD brokers which are actually the entities scamming the customers and then sharing the loot with the advertisers. In our case it was a broker named GFC Investment which is a very nasty broker with tons of complaints. So, if you were spammed or illegally solicited to join the fraudulent Cannabis Millionaire software, you should know that there are multiple warnings by a myriad of official watchdog websites who are officially warning the public to stay clear of the Cannabis Millionaire scam and others similar to it. The Cannabis Millionaire scam is particularly misleading and deceptive because it is a viral get-rich-quick scheme which is being promoted very aggressively by affiliate networks and media agencies specializing fake Cannabis and make-money schemes. If for some reason you are under the impression that the Cannabis Millionaire scam is a genuine or legitimate trading software, then you need to continue reading our detailed review because we caught these ripoff artists red handed and exposed them! 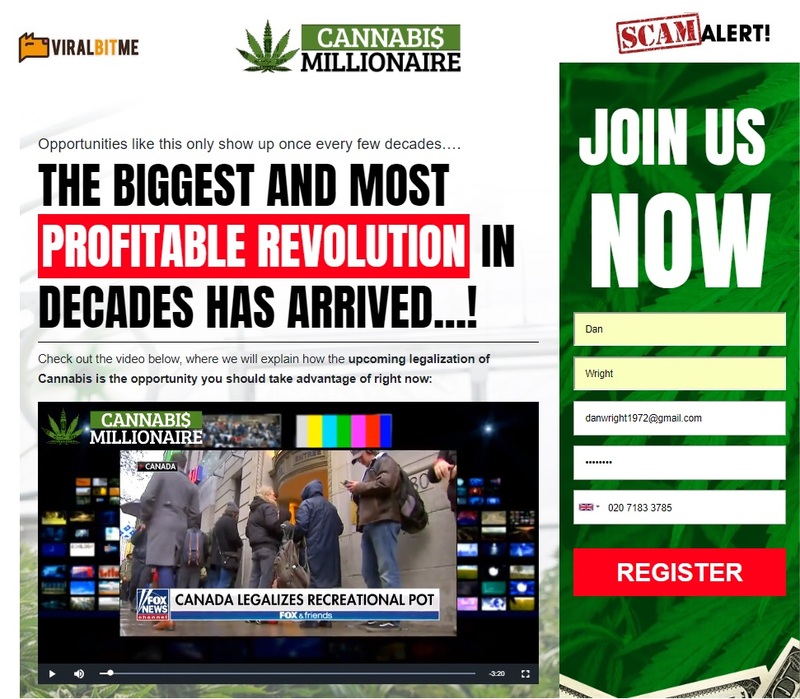 OK, so here we have the totally hyped up registration page and members area for the Cannabis Millionaire software. Most members are not even aware that they not are signing up for “Cannabis Millionaire”, rather for a broker. It is not mentioned in the registration area and you really need to dig in deep to understand you are signing up for a CFD broker. The secret is out and people know that Marijuana stocks are peaking due to legalization of cannabis for medical and recreational use specifically in Canada and the United States. Medical Marijuana Dispensaries are issued permits and pot is becoming a legitimate drug across North America (not to mention the Netherlands). Scammers are not oblivious to this new development and are riding the Cannabis wave of success as legally traded companies focusing on the manufacturing and distribution of legal Marijuana are making millions due to increased demand. What Is Cannabis Millionaire and How Does It Work? Cannabis Millionaire is a get-rich-quick scheme which is tapping into the Cannabis hype and trying to sell you fake Forex and CFD contracts. When you invest the broker steals your money and then sends kickbacks to the advertisers in what is commonly referred to as a revenue of profit share scheme. Don’t sign up. Cannabis Millionaire Review, Legit Opportunity Or SCAM? The Cannabis Millionaire SCAM is baiting you in the sense that it tells you that the investing scene is rapidly changing and that there is no need to buy actual Cannabis stock because you can purchase a CFD or Contract for Difference. They would have you believe that “CFD’s are more profitable than shares; as you can actually leverage the small amounts of money you invest, allowing you to make a lot more money, much quicker, as opposed to buying shares which are expensive, limited and take a lot of time to grow.” This is a half-truth (which is worst than a lie) because buying a CFD with a broker carries a very high degree of risk, and doing it with an unlicensed broker practically guarantees you will lose your money without having any way to remedy your situation. No, it’s going to cost you at least $/€/£250 in order to activate the software and that money will be collected by the filthy Cannabis Broker which is assigned to you. There have been initial reports of Cannabis Millionaire being used with the Dragons’ Den cast and Elon Musk. We are currently looking into this and will produce proof of fake news when and if we are able to obtain it. There are various fake Cannabis Millionaire Reviews, and they are all designed to get you signed up with a fake broker so that the affiliate marketers can get their commissions. This type of activity is both unethical and also not smart from a business perspective, but that is another issue which needs to be addressed. Our staff was able to gather a proper alternative for investors wanting to try out a legitimate trading app. We have tested this software and it is both legit as well as profitable so we highly recommend it especially if you are just starting out with stocks. The Cannabis Millionaire SCAM software, app, and trading software is a confirmed investment SCAM and get-rich-quick scheme. We are advising all our members to avoid this fraudulent software and trade stocks with a legitimate trading app as we have recommended above. Should you have any questions or need additional clarifications, please message us through our contact page. Bitcoin Compass Review, Viral SCAM Exposed! Weed Millionaire Review, Fake Weed Millionaire SCAM is Viral! Am still confused… is it legal or not…. cannabis millionnaire? No, It’s a SCAM and it’s illegal.